Here are some more photos of the pieces in process of being made. Again to see larger images of each photo just click on the image. Melanoma bowls are a bit of a continuation of a technique I had developed for work in my grad show Growth. I wanted to create tumor like adhesions that would appear to grow on the side of a pot. I even wanted to have them be a rich red - blood like appearance. The way I make the product is to crush up witness cones to a powder like substance, add some water to make it like a paste and apply it to a leather hard pot. Witness cones are a commercially produced product that we uses to measure the heat work in the kiln. They are made for a variety of temperatures that we refer to as cones - you may have heard someone say my clay is cone 04 or cone 6. The cones melt and bend at the different temperatures to allow us to witness the temperature of the kiln. 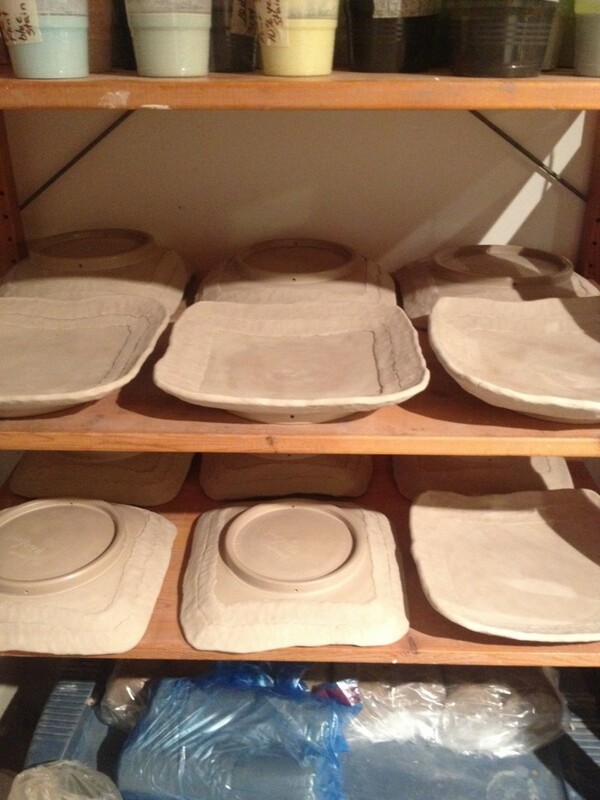 Here is an internet photo of conepacks for an earthenware kiln firing. What I discovered is that when you overfire these crushed up cones, they boil, they blister, and they change colour into a deeper red that I find appealing. So when I used cone 03 & 04 cones and fired them to cone 3, I was able to get a look that to me resembles a blood filled tumor. 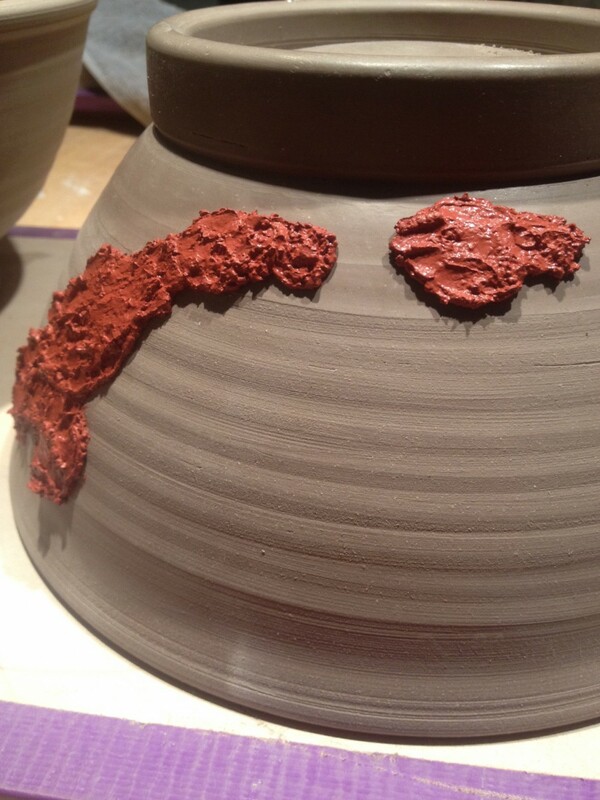 The work entitled Melanoma Bowls have these growths on them and when the glaze surrounds the cone pack material it makes them appear as if they are growing out of the bowl. For External Fixation, I cut the side of the bowl and then added small bands of clay that to me referenced metal plates. I want the viewer to be reminded of orthopedic repairs using metal plates and I used small pieces of wire to look like rivets. I used a glaze called Andreas Bronze to make the plates look metal and highly toxic glaze looks fantastic. 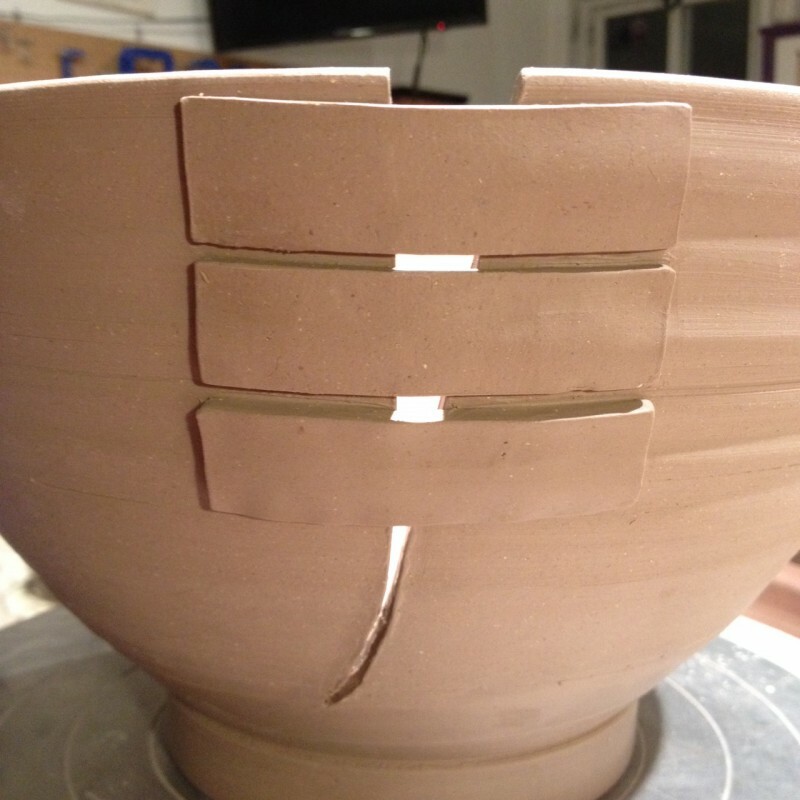 Here is a photo of the bowl in mid process of putting on the clay plates. In Ulcerated Fusion, I wanted to not only experiment with using wire with the clay, but I also wanted to reference and represent surgical staples. When I had surgery in 2009 to remove a large tumor in my abdomen, my large incision was closed by using staples. Once it was time to have them removed, I was absolutely fascinated with these little metal structures that were able to hold my skin together to heal. I drilled holes in the clay before the first firing to facilitate the staples and after the first firing I cut the wire and bent it in order to make the staple like structure. 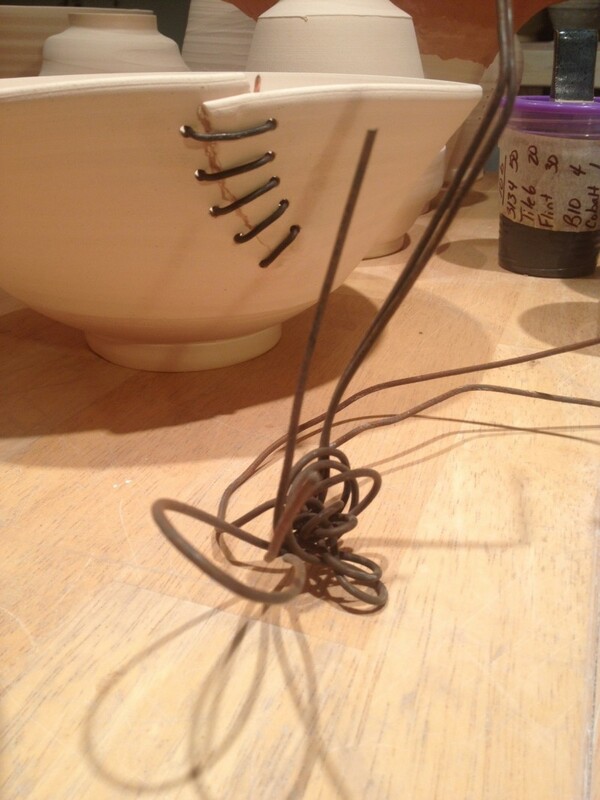 The wire came from the metal shop at NSCAD and is a waste material for them. When they get in lengths of iron and steele for working in the shop, it is held together with this wire. I have no idea what it is made of but it looks awesome when fired. I put the staples in before I glazed it because I found a little bit of glaze around the hole and the wire acts as a catalyst to improve the melting and effect of the wire. The whole idea of blending thrown work and hand built work was inspired by potter Todd Hayes. He showed how to add a coil onto a thrown plate that loosened up the form and created a unique usable object that had many of the desirable components that I appreciate. Those components are clean finished foot, balanced feel to the base with the rim, flexibility in form, and looseness of a rim. I knew I wanted to try this process for a long time and thought a wall piece of plates would show off the technique well. First I had to decide on the shape of the plate. Square is always good and creates an interesting grid pattern but the hexagon is always appealing to me. I like that when 7 of them are placed together they create a flower shape, and they do fit together so well. I finally decided on square and began making! I started with 12 plates and the finished wall piece was of 6. There was a lot of loss in the work but I was very happy with the finished product. It is certainly something I am going to do more of. Next posting will be of the finished pieces. I am going to stop in this week and get some photos of the pieces in the gallery. I'm really busy right now getting ready for the Dalplex craft show, The last minute craft show and putting some mugs in TAN coffee in Windsor. It is a busy time of year!